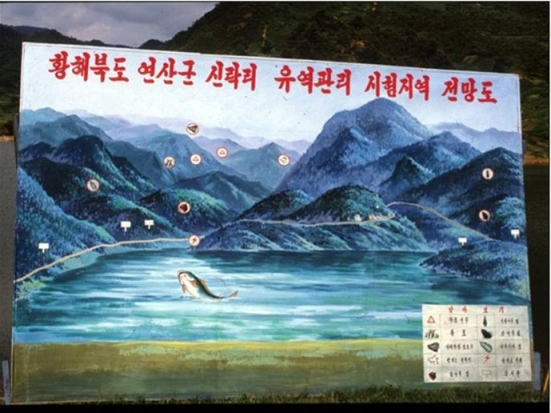 DPR Korea covers an area of 122 762 km2, 80 percent of which is classified as hills and mountains. Most upper hills and mountains are wooded, but up to a quarter of non-agricultural uplands are bare. The mountainous topography leaves few areas suitable for farming, and only 1.85 million ha (15 percent of the total land area) is currently cultivated. Agriculture remains a major contributor to gross domestic product (GDP) and receives high priority in DPR Korea policy-making. The main climatic constraint in DPR Korea is the short growing season caused by rigid winters and rainfall that is concentrated in the May to September period. Uncertain rainfall in spring can make main crop establishment difficult, and heavy rains in July and August can damage crops and generate upland erosion. In recent years, agricultural production has declined because of natural disasters (hailstorms, droughts and floods), environmental degradation and economic difficulties. To address the hydrological imbalance, DPR Korea requested assistance from FAO’s TCP for the protection and sustainable development of upland catchments. Project TCP/DRK/0169 (extended as TCP/DRK/3002(A)) was conceived to strengthen forest, soil and water conservation activities in order to reverse upland degradation. The project also aimed to introduce sustainable hillside farming and gradually to phase out agriculture from steeper slopes. It followed a participatory and integrated watershed management approach, so as to make sustainable natural resources management compatible with rural livelihoods. development of appropriate integrated watershed management approaches and technologies. development of a comprehensive watershed management plans for these two sites. Afforestation, agroforestry and intercropping trials and sediment monitoring on sloping fields and in rivers have been initiated. capacity building at different national levels, which resulted in trained officials and technicians, who are able to implement integrated watershed management. Capacity created by the project is expanding beyond the project context; for instance, the Academy of Forest Sciences is developing a watershed management plan for the Taedong River, which flows through Pyongyang City. Implementation of the project has promoted closer collaboration among government agencies at different administrative levels. A particularly interesting experience was a national workshop in 2003, which focused on preparation of a medium- and long-term participatory integrated watershed management investment programme for DPR Korea. The event was attended by approximately 50 government officers, scientists, county field staff and representatives from international organizations. Following this workshop, the government endorsed the medium- to long-term investment programme for participatory and integrated watershed management in DPR Korea. The investment programme has a modular structure and includes eight project profiles covering capacity building in the Ministry of Land and Environment, participatory management of critical watersheds, development of a watershed information system, development of watershed research capacity, land protection and stream treatment in selected locations, sustainable forest management, and control of forest insect pests.